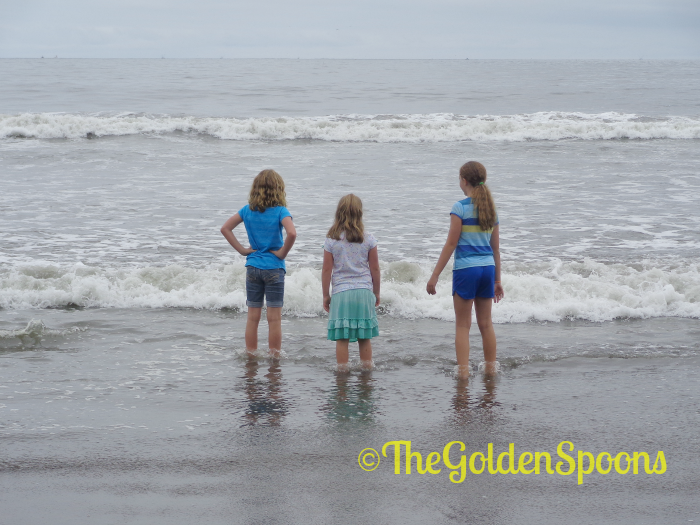 Back in August, right before the girls went back to school, we took a family trip to San Francisco. That's a long way across the country from our home in North Carolina! It was a great trip. 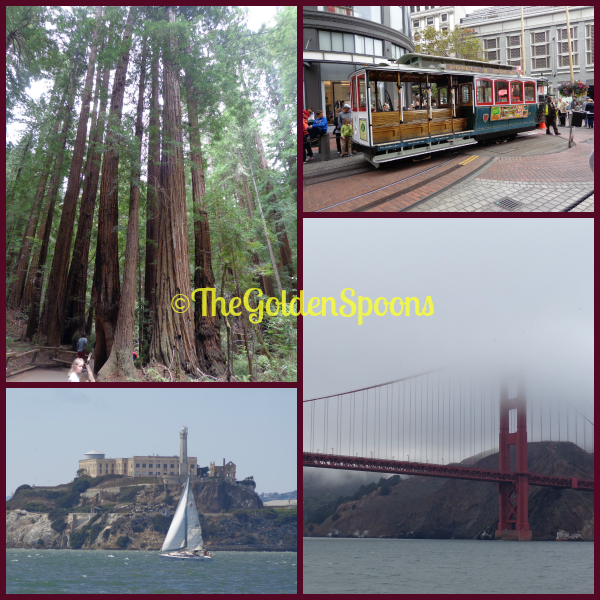 We saw Alcatraz, the Golden Gate Bridge, the iconic trolley cars, the majestic redwoods at Muir Woods, and so much more. One highlight of the trip was our excursion to Stinson Beach. It is touted as one of the best beaches in the Bay Area and gave me the chance to cross "putting my toes in the Pacific Ocean" off my bucket list. 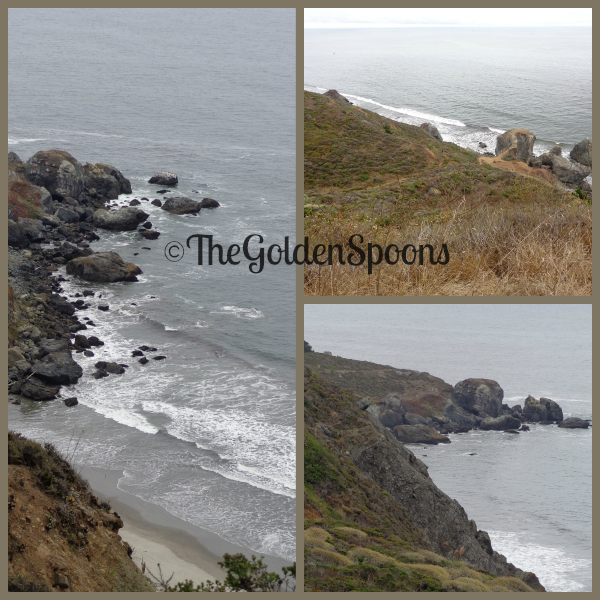 The views as we drove along the Scary Road. 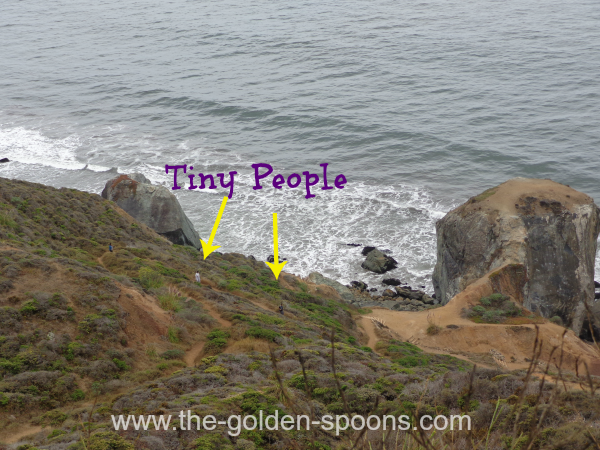 See how tiny those people seem?? That's how high we were on the road at the top of this cliff. My white knuckles and heart palpitations were a small price to pay, I suppose, for what was otherwise a fabulous trip - a trip that was possible for us because of my husband's business travel. My husband is in sales and travels A LOT - as in the people at the airport know him by his first name and frequently ask how his kids are. Often, when people realize how often David is away, they say to me, "How do you handle him being gone all the time?" or "Wow! I don't know how you manage it all with him traveling so much!" Well, the truth is that it's just what I'm used to. He has been traveling since we were first married and I have just learned how to cope. 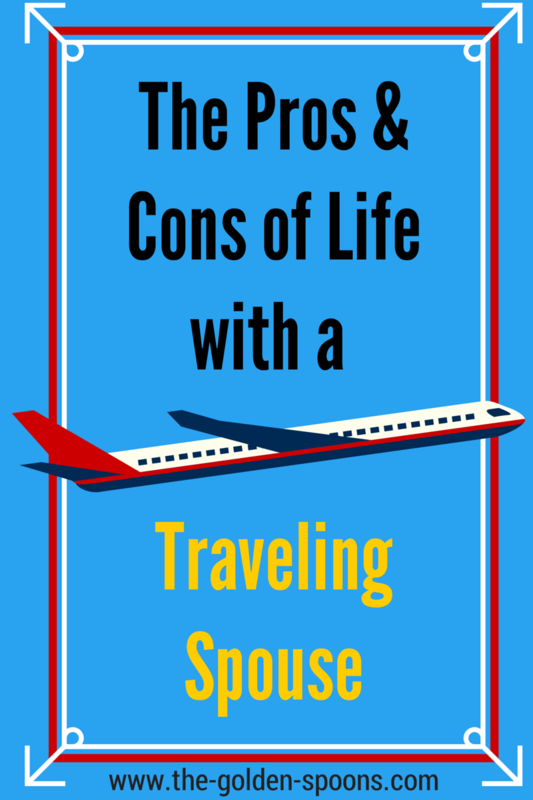 Like most things in life, there are pros and cons to the situation. Travel Rewards - Case in point - San Francisco. Because of the many, many airline points David had accrued, the girls and I flew for free. We were also able to get a couple free nights at the hotel by cashing in his hotel honors points. If we had to pay for all that out of pocket, we probably wouldn't have gone. The same was true a few years ago when we went to Disney. Then, we also flew for free and got hotel nights free. I have gotten to tag along with him to many other cities including Miami, Chicago, Minneapolis, and PARIS!!! Alone Time - I am an introvert by nature and I need alone time to reset and refocus. Of course, I love having David at home in the evenings. But, when he is gone, I can use that time to write, go to bed early, and/or just enjoy some quiet time after the kids are in bed. Absence makes the heart grow fonder. - I think that, because he is gone so much, I appreciate it more when he is home and, hopefully, he feels the same way about the girls and me. Single Parenting - It's not true single parenting, I know, because he is still the primary breadwinner for our family and we still communicate daily about family decisions. However, when he is gone, all the day to day mechanics fall on me. I am the one getting kids to school, doing all the chores, helping with the homework, and doing the bedtime routine. Inconsistent Schedules - One week he's home, the next week he's gone. Two days this week; four days that week. I am constantly asking, "When will you be home again?" and "Should I count you in for dinner that night or will you be getting back too late?" The girls ask, "When will Daddy be home?" No week is ever the same. See the other side - I once was very honest with David about how jealous I sometimes was of his traveling while I was stuck at home in all the minutiae. He retorted that the grass is not always greener on his side. He lives out of a suitcase and sleeps in a different bed almost every night. He has to deal with the headaches of travel like airport security and delayed flights. Also, it's not like he is just out enjoying all the cities he visits. When he is there, he is scurrying between meetings and presentations, rarely having any time to do "touristy" things or take in the sights. Above all else, he misses all the things I get to see. He's missed soccer games, awards programs, impromptu laughter, and bedtime kisses. Sometimes, he is just as jealous of me as I am of him. Lean on your village - I would love to tell you that I am Superwoman and I can do it all on my own. I can't. Thanks goodness for all the people who help me out when I am juggling schedules, or sick kids, or when I just need a little break. They make life with a traveling spouse a million times easier. Use Technology - When David is gone, we FaceTime as often as possible so he and the girls can still talk. My girls are old enough to have email and they know they can email him when he is away. Just the other night, David and I had an entire conversation via texting while he was on a plane and I was sitting on our couch in my pajamas. Cut yourself some slack - When David is gone, I rarely cook a "real" meal for the girls and me. I let the kids skip showers some nights. If they watch a little too much TV so I can finish the dishes, then so be it. I do the best I can when I'm on my own and I don't feel guilty (much) for the things I cannot get done. I only have two hands. How about you? Do you or your spouse travel for work? What are the pros and cons for your family? What are some ways you make it work? I know what you mean - I've gotten used to that alone time, too. The travel rewards have really been an awesome benefit! Paris was so wonderful. I hope you get to go sometime! It has definitely gotten easier to handle David's travel now that the kids are a little older. Some of those days when they were little were tough. I didn't get nauseous on that road, but Iw as holding on for dear life! Ugh! I don't think I could have done it in the back seat. Although, my kids were back there and they seemed fine - they laugh dat me the whole time! And, 5 kids - wow! I definitely think it was harder when my girls were little - much harder. Fortunately, my husband is never gone for more than 4-5 nights at time. I have a HUGE respect for military wives who spend weeks or months alone while their husbands are deployed. Exactly! I love that alone time, but then again - I'm alone! :-) It's a positive and a negative altogether. Ah! Hawaii is on my bucket list. That highway sounds equally magnificent and terrifying! I love these tips because, yes, when the hubs travels it is tough. All of those feelings you mention combine so well. I love this!! My husband travels for business, too! And it's the inconsistent schedule that gets me most. I think only someone with another traveling spouse can understand. I once said the single parenting thing to a friend and she shot back that it wasn't similar because we'd had no pain of divorce, etc. I know it's not exactly the same, but there are definitely times when I'm doing everything on my own--just like any single parent out there. I'm just careful who I use that analogy with nowadays. All so true. It doesn't happen so much anymore but I do use those times for bonding with Christopher. Though it's just us two most of the time, it's different when my husband won't be home that night. In those times we eat something that my husband doesn't necessarily care for. As for those roads, I'm getting better about being a passenger but I definitely wouldn't want to drive! I'm thinking of bringing a blow-up mattress!!! I don't really want to drive to a hotel but I can NOT sleep on those beds. Seriously. I agree with he single parenting thing. I realize I don't have to bear the financial burden by myself, etc., but doing all the day to day alone is tough. Ha! Good point - as scared as I was in the passenger seat, it was probably better than me behind the wheel!